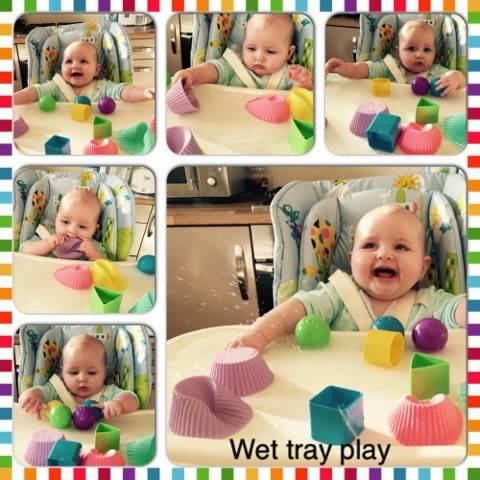 Baby Pebbles: Baby Activity: Wet Tray Play! Some water safe toys, or bottle tops (as they float). This was a lot of fun to watch Penny doing, she hasent quite grasped splashing yet but she was moving her toys around and sucking the water of them and her hands. She enjoyed herself rather a lot once she got used to it. The girl was completely soaked through! So easy and doesn't cost a thing. It's nice to know she can do this activity for a long time yet and as she grows she'll enjoy it more and learn from it! The clear up wasent too bad just a tea towel for the floor and high chair, super!